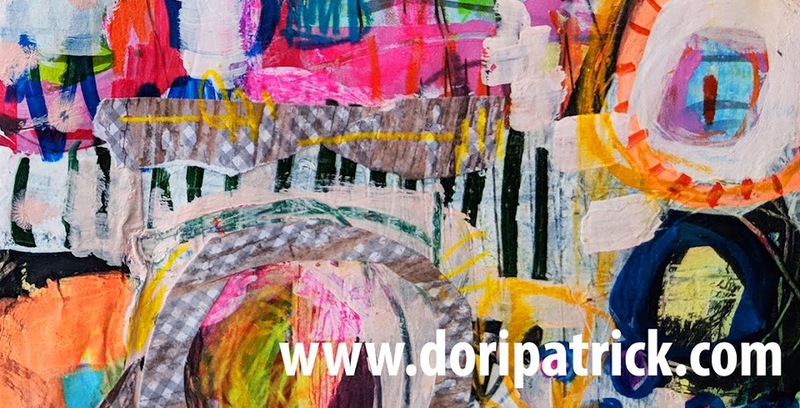 Dori Patrick, Artist & Dreamer of Dreams: Abstract Painting Workshop with Kiddos! 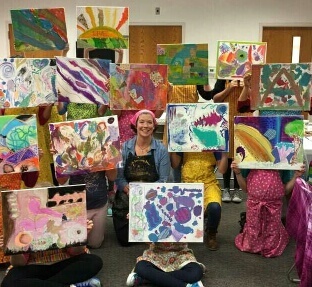 Last weekend I had the pleasure and honor to teach an abstract painting workshop to some fabulous kiddos at the Hiawatha Public Library. You guys, they rocked it. They were such a sweet, open-hearted bunch. They just rode along on my crazy train of suggestions and ideas for moving the hand on the canvas, and they created awesome, unique pieces! There's something a child has.....I wish I could bottle it, and force adults to drink it. Children have an innate ability to JUST HAVE FUN. We warmed up with a scribbling exercise timed to music, and after just a few minutes of that, their cheeks were rosy, and their eyes were shining. They were IN. And ready for more. Our time together went by far too quickly. I enjoyed this class more than I expected to...and per usual, I came away from the experience learning a little bit myself! Funny how that works! If you are looking for more childlike wonder in your creative practice....here are some suggestions I gathered from my artist friends that day. 1) Stay curious. Always approach your creative process with the words "what if." "What if I put this blue down next to this coral?" "What if I dabbed the paper towel into this wet ink?" 2) Stay brave. Just DO the above mentioned "what ifs." Seriously. It's just canvas or paper. No one's going to die because you are trying something "crazy" with your art. 3) Stay in tune. Really listen and pay attention to what feels right and what's fun for you to make. Do you feel like covering your art with tiny little circles? Get down with your bad self. Does it feel good to smoosh it around with your hand? Do it. Just do it until you don't feel like doing it any more. 4) Stay in the moment. Yep....this one is tough, because "adulting" requires us to have so many balls in the air at one time. Try.....even for five minutes to just set aside the pressing matters of the day, and move your hands...even if it's in a journal or on the back of a receipt. You'd be surprised where and how often you can slip in little moments of joy.